The M1575HCT-22P-MR is a rugged high performance passive antenna designed for the GPS L1 band, and built on Maxtena proprietary Helicore® technology. This technology provides exceptional pattern control, polarization purity and high efficiency in a very compact form factor. The M1575HCT-22P-MR is a screw-on design, featuring an integrated SMA connector. The ultra light design is rated IP-67 when both mounted and unmounted for added protection. 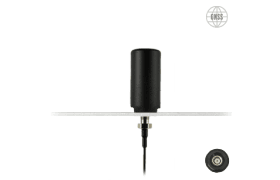 This product is designed for applications requiring high quality reception of GPS signals. It is compatible with Sarantel SL1203A mounting interface.